Biography*: There is a baby Graser buried November 10, 1916 in her father James Sullivan's cemetery plot Lot 3, Bl 24, Sect. Y. She was living in New York City in early 1916, so not sure if child is hers or her in-laws. No children are listed in her death notice. Death*: She died on 13 September 1964 at Chicago, Cook County, Illinois, USA, at age 84. Graser -- Agnes Graser, nee Sullivan, of 5555 Sheridan road, suddenly, beloved wife of the late Albert E; fond aunt of eleven nieces and nephews. Funeral Tuesday, 9:15 a.m., fro Hursen Chapel, 929 Belmont avenue, to St. Ita church, Mass 10:00 a.m. Interment local. Omit flowers, please. [S1379] Chicago Tribune, September 14, 1964, page C6, ProQuest Historical Newspapers, Chicago Tribune (1849-1987), accessed February 2011. [S1346] Cook County Clerk's Office, online http://www.cookcountygenealogy.com, Agnes Glaser, certificate no. : 665161, Accessed May 29, 2011. Note*: He and Ellen "Nellie" Theresa Madigan bought the two flat located at 18 N. Latrobe, Chicago, sometime between 1918 and 1919. Employment: He was not employed on 3 April 1940. Alex states on the 1940 US Census that he was "seeking work" at the time of the census. In addition, he states he has been unemployed for 40 weeks prior to March 30, 1940. Association: Alexander Aloysius Sullivan was associated in 1955 at Knights of Columbus, Damen Council #650, Chicago, Cook County, Illinois, USA. "Thanks to the efforts of Father Michael J. McGivney, assistant pastor of St. Mary’s Church in New Haven and some of his parishioners, the Connecticut state legislature on March 29, 1882, officially chartered the Knights of Columbus as a fraternal benefit society. The Order is still true to its founding principles of charity, unity and fraternity. Association*: He was associated in 1955 at Chicago, Cook, Illinois, USA. Pipe Fitters Union, Local No. 597. Chicago has played an instrumental role in the development of the piping industry since the inception of unions. The original UA headquarters was located in Chicago. Shortly after the UA was formed, the Steam Fitters’ Protection Association Local 2 of the International Association was organized, holding their first meeting at the Plasterers’ Hall in 1885. Workers were on the job 10-12 hours a day, six days a week. Safety of workers was not a concern to most employers. Wages were low, and workers had no protection against medical bills if they were injured on the job. With the establishment of the Protection Association, steamfitters were able to negotiate with their employers, striking for the first time in 1886 to get an eight hour work day. Further negotiations brought health benefits and retirement plans to protect workers from unforeseen disaster. Local 597 has enjoyed a stable history, electing only three business managers since 1900 when “Walking Delegates” were replaced by Business Managers. Charles Rau served his union well for 50 years, 1901 - 1951. Martin J. Ward served as Business Manager from 1951 – 1958. Francis X. McCartin became a legend in the labor movement during his 43 years as Business Manager 1958 - 2001. The Francis X. McCartin Training Center became Chicago’s first union apprenticeship training facility. Elected in 2001, James Buchanan took apprenticeship training to a new level, with the construction of a state-of-the-art training facility in Mokena, Illinois. Through Mr. Buchanan’s leadership Local 597 has seen changes in benefits and wages that improve the quality of life for its members. A fire broke out late Monday morning at 18 N. Latrobe. Three engine companies responded to the fire which caused $600 damage. The fire started in the basement near the boiler. Hot ashes removed from the furnace caused some near-by rubbish to burn, firemen said. The fire spread to a first floor bedroom. The building, a two-story apartment, is owned by Alexander Sullivan, who lives on the second floor. Three engine streams were used to put out the blaze. The companies were 96, 67, and 113. Damage to the building was estimated at $500 and $100 to contents. Death*: Alexander died on 26 January 1956 at Chicago, Cook, Illinois, USA, at age 75. Dr. William Fitzgerald was Alexander's doctor. His office was at 5158 W. Madison Street, about two blocks from Alex's home. Death Notice: Sullivan - Alexander A. Sullivan, beloved husband of Nell Madigan Sullivan; fond father of Thomas and Helen McIntyre; grandfather of Thomas Sullivan, Larry and Elaine McIntyre; brother of the Rev. Charles, S.J., and Philip Sullivan. Funderal Monday, 9:30 a.m. from chapel, 5911 W. Madison street, to St. Thomas Aquinas church. Interment Queen of Heaven. Member of Pipe Fitters union, local No. 597, and Damen council, No. 650, K. of C. EStebrook 8-7500. Chicago Daily Tribune, January 28, 1956, page 10. Blog: Alexander Aloysius Sullivan and Ellen "Nellie" Theresa Madigan were mentioned in a blog at http://sullivanmadigan.blogspot.com McIntyre/Walsh Genealogy Blog on 18 February 2010. [S436] Alexander Sullivan, Illinois birth certificate no. 3298 (24 March 1880). [S910] "Alexander Aloysius Sullivan WWII Draft Registration Card", Ancestry.com, accessed June 14, 2009. [S2181] U. S. Social Security Applications and Claims Index, 1936-2007, online www.ancestry.com, Alexander Aloysius Sullivan entry, claim date 10 Aug 1945. [S437] Book 4, page. 291 Baptismal Register, Alexander Sullivan baptismal certificate, 28 March 1880, Holy Family Church. [S438] Book 4, page 291 Baptismal Register, Alexander Sullivan baptismal record: (MF # 1704692, Family History Library [FHL], Salt Lake City, Utah), 28 March 1880, Holy Family Church. [S446] 1900 US Census, Illinois, Cook County, Chicago, Washington, DC, ED 604, Sheet 13A, Line 20, Ward 19, (Ancestery.com http://content.ancestry.com/iexec/) Print out dated 15 August 2005. [S450] 1900 Chicago City Directory, MF #1376703. [S441] Sullivan-Madigan marriage license: issued 17 August 1907. [S439] Certificate, Sullivan-Madigan marriage of 20 August 1907. [S440] Marriage Register: entry for Sullivan-Madigan, 20 August 1907 St. Agatha Church, Chicago, Illinois, (MF #1704626, Family History Library [FHL], Salt Lake City, Utah). [S441] Sullivan-Madigan marriage license: Certificate no. 464865, issued 17 August 1907. [S569] Aloysius Alexander Sullivan, Illinois birth certificate no. 15323, Family History Library, MF# 1288163 (July 20, 1908). [S452] 1910 US Census, Illinois, Cook County, Chicago, Washington, DC, ED 660, sheet 6A, line 30, (Family History Library [FHL], Salt Lake City, Utah, MF# Unknown). [S448] 1917 Chicago City Directory, MF #1759647. [S443] Alexander Sullivan, WWI Draft Registration Card, Division IL030. [S443] Alexander Sullivan, WWI Draft Registration Card. [S443] Alexander Sullivan, WWI Draft Registration Card, Serial number 14171, Order number 2238. [S442] 1920 US Census, Illinois, Cook County, Chicago, Washington, DC, ED 2125, Sheet 4A, Ward 33, Ancestry.com, accessed August 13, 2005. [S442] 1920 US Census, Illinois, Cook County, Chicago, Washington, DC, ED 2125, Sheet 4A, Ward 33, (Ancestery.com http://content.ancestry.com/Browse/view.aspx) Print out dated 15 August 2005. [S442] 1920 US Census, Illinois, Cook County, Chicago, Washington, DC, ED 2125, Sheet 4A, Ward 33. [S447] 1930 US Census, Illinois, Cook County, Chicago, Washington, DC, ED 16-1308, Sheet 12B, Line 55. [S1516] April 3, 1940 US Census, Illinois, Cook County, Chicago, Washington, DC, ED 103-2329, page 2B, Accessed online, April 3, 2012. [S444] Chicago Tribune, 28 January 1956, Section F, Page 10. [S2257] Chicago Austin News, November 9, 1955, p. 27. [S74] Alexander A. Sullivan, Medical certificate of death. [S75] Alexander A. Sullivan Interment records, 1900-1986, Queen of Heaven Cemetery, Hillside, Cook County, Illinois, USA, Lot 104, Blk 8, Sec 20, Gr 4. [S459] Helen Sullivan, Illinois birth certificate no. 20790 (25 March 1914). [S69] Holy Family Church Baptismal Register, Sullivan, Anastasia Baptismal Record: Family History Library, MF# 10704691/4, April 14, 1869, Family History Library [FHL]. [S1251] Illinois, Deaths and Stillbirths Index, 1916-1947, online FamilySearch.org, FHL MF#1504132, accessed December 28, 2014; Anna Gahagan death December 23, 1925. [S1974] Anna Gahagan, Illinois Certificate of Death, FHL MF#1504132, accessed January 13, 2015. [S69] Holy Family Church Baptismal Register, Sullivan, Anastasia Baptismal Record, April 14, 1869, Family History Library [FHL]. [S2521] 1900 US Census Wisconsin, Winnebago County, Oshkosh City, Washington, DC, ED 146, sheet no. 11, line 28, Ancestry.com accessed September 4, 2017. [S668] 1910 US Census, Illinois, Cook County, Evanston, Washington, DC, ED 101, Sheet 20B, Family History Library, MF #? [S669] 1920 US Census, Illinois, DuPage County, Winfield Township, West Chicago, Washington, DC, ED 25, Sheet 5B, Ward 1, Ancestery.com; accessed March 20, 2006. [S671] Anna Gahagan, Illinois Statewide Death Index. [S1676] Find A Grave, online http://findagrave.com, Anna M. "Annie" Sullivan Gahagan, Memorial #144588169 created by DESchuett on April 4, 2015. [S480] Andrew Sullivan, Illinois Physician's certificate of death. [S1471] John Gager, Chicago City Directory, 1856/57, pages 321-322. [S1471] John Gager, Chicago City Directory, 1857/58, page 285. [S1468] D. B. Cooke, Chicgao City Directory, 1959/60, pages 380-381. [S1468] D. B. Cooke, Chicgao City Directory, 1860-61, page 346. [S482] 1860 US Census, Illinois, Cook County, Chicago, Washington, DC, Ward 7, page 893, line 1, (Ancestry.com http://content.ancestry.com/iexec/) Information searched August 20, 2005. [S1463] T. M. Halpin, Chicago City Directory, 1861-62 edition, page 338-339. [S666] Halpin and Bailey, Chicago City Directory. [S1463] T. M. Halpin, Chicago City Directory, 1862-63 edition, pages 388-389. [S1463] T. M. Halpin, Chicago City Directory, 1863-64 edition, page 441. [S1464] John C. W. Bailey, Chicago City Directory, Year 1864-65, pages 542-543. [S1463] T. M. Halpin, Chicago City Directory, 1865-66, pages 612-613. [S1464] John C. W. Bailey, Chicago City Directory, 1867, pages 946-948. [S1467] Bailey and Edwards, Chicago City Directory, 1868, pages 871-873. [S1466] Richard Edwards, Chicago City Directory, 1869-70, pages 863-865. [S1466] Richard Edwards, Chicago City Directory, 1870-1871, pages 801-803. [S483] 1870 US Census, Cook County, Illinois, Washington, DC, Ward 18, page 137, line 1, (Ancestry.com http://content.ancestry.com/iexec/) Viewed 20 August 2005. [S1465] Richard Edwards, Merchants' Chicago Census Report 1871, pages 1076-1079. [S1466] Richard Edwards, Chicago City Directory, 1871, pages 866-868. [S481] Sullivan-Duggan marriage license: certificate # 132, issued October 21, 1971. [S1141] Marriage Register: entry for Andrew Sulliivan and Jane Duggan, 22 October 1871 Holy Family Church, Chicago, Cook County, Illinois, USA, Family History Library, MF#1704694, Wilmette Family History Center. [S565] Michael A. Sullivan, Illinois certificate of death, Family History Library, MF # 1852690. Birth*: Andrew was born at Chicago, Cook County, Illinois, USA, on 25 November 1869. Baptism: He was baptized at Holy Family Church, Chicago, Cook County, Illinois, USA, on 28 November 1869. Religion: Roman Catholic. Sponsors Farrell Reilly and Margaret Reilly; Information from Holy Family baptismal records. [S494] 1880 US Census, Illinois, Cook County, Chicago, Washington, DC, ED 86, sheet 8, line 8. [S1571] Probate Court of Cook County no. 2175 (Docket 3, page 245, box 2), Proof of Heirship, dated October 16, 1883. [S555] 1870 US Census, Illinois, Cook County, Chicago, Washington, DC, Ward 9, Page 172, Ancestry.com. [S684] Chicago Tribune, November 25, 1918, Chicago Tribune Historical Archive: Record Number 19181125dn031. [S686] Chicago Tribuen, September 6, 1973, Chicago Tribune Historical Archive; Record Number: 19730906dn089. [S916] Andrew Lawrence Sullivan, Illinois birth certificate no. 15303, Family Search, Illinois, Cook County Birth Certificates 1878-1922, accessed Marach 20, 2009 (November 15, 1898). [S685] Chicago Tribune, September 5, 1973, Chicago Tribune Historical Archive; Record Number: 19730905ob009. [S1211] 1900 US Census, Illinois, Winnebago County, Rockford Township, Rockford City, Washington, DC, ED 138, Sheet 6A, Rockford Ward 4, Ancestry.com, accessed April 4, 2007. [S995] 1910 US Census, Illinois, Cook County, Chicago, Washington, DC, ED 1054, Sheet 9A, Ward 25, Ancestry.com accessed April 16, 2007. [S688] Chicago Tribune, December 31, 1918, Chicago Tribune Historical Archive; Record Number: 19181231dn037. [S996] 1920 US Population Census, Illinois, Cook County, Chicago, unknown repository address, ED 1485, Page 3A, Ward 25, Ancestry.com, accessed April 16, 2007. [S764] Victoria Emma Sullivan, Illinois Certificate of Death, FHL# 1953739. Birth*: Andrew was born at Chicago, Cook County, Illinois, USA, on 18 January 1885. Information from Baptismal record. Baptism: He was baptized at St. Vincent Church, Chicago, Cook County, Illinois, USA, on 25 January 1885. Religion: Roman Catholic. Death*: Andrew died on 5 February 1892 at 1101 Wrightwood Avenue, Chicago, Cook County, Illinois, USA, at age 7. Sullivan - At 1101 Wrightwood av., Andrew Paul Sullivan, aged 7 years, only child of Mary Davis Sullivan and the late James Sullivan. By carriages to Calvary Saturday at 1 o'clock. Funeral private. [S573] Andrew P. Sullivan, Illinois Physician's Certificate of Death, Family History Library, MF# 1033004. Death*: Andrew died on 13 April 1964 at Swedish Covenant Hospital, Chicago, Cook County, Illinois, USA. 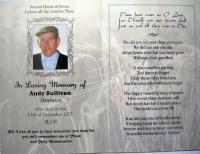 Sullivan - Andrew W. Sullivan, of 4145 Broadway, dear brother of Agnes Graser. Funeral Wednesday 9:30 a.m. from Hursen Chapel, 929 Belmont Av. to St. It's Church. Mass 10 a..m. Interment Calvary. Omit flowers please. Chicago Daily News, April 14, 1964, page 40. Andrew W. Sullivan -- Mass for Andrew W. Sullivan, 98, of 4145 Broadway, who retired in 1956 as chief legal clerk in the city corporation counsel's office, where he was employed 25 years, will be said at 10 a.m. tomorrow in St. Ita Catholic church, 5500 Broadway. Mr. Sullivan died Sunday in Swedish Covenant hospital. He is survived by a sister, Mrs. Agnes Graser. Chicago Tribune, April 14, 1964, page B10. Andrew W. Sullivan - Mass for Andrew W. Sullivan, 98, of 4145 Broadway, who retired in 1956 as chief legal clerk in the city corporation counsel's office, where he was employed 25 years, will be said at 10 a.m. tomorrow in St. Ita catholic church, 5500 Broadway. Mr. Sullivan died Sunday in Swedish Covenant hospital. He is survived by a sister, Mrs. Agnes Graser. [S1380] Chicago Tribune, April 14, 1964, page B10, ProQuest Historical Newspapers, Chicago Tribune (1849-1987), accessed February 2011. [S488] James Sullivan Cemetery Record, Graves purchased 1892, Calvary Cemetery, Evanston, Cook County, Illinois, USA, 3rd S. E. Corner. 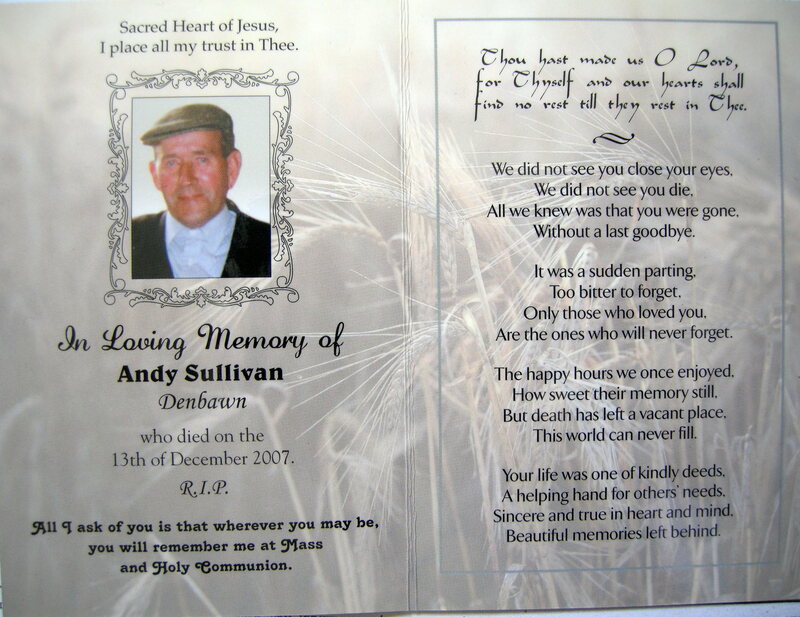 Death*: Andy Sullivan died on 13 December 2007 at Denn Parish, Cavan, County Cavan, at age 76; The death has occurred of Andy Sullivan, Denbawn, Carrickaboy, Cavan. Reposing at Finnegan's Funeral Home, Dublin Road, Cavan from 5:30 pm this Firday evening until removal at 7:30 pm to St. Matthew's Church, Drumavaddy to arrive at 8 pm. Requiem Mass tomorrow, Saturday, at 11 am. Interment afterwards in the Old Cemetery. [S2438] Katie Sullivan Cemetery Marker, Drumavaddy Old Cemetery, Denn Parish, Cavan, County Cavan, Ireland. [S2454] Michele Cahill, "Thomas Cahill and Kathryn Teresa Sullivan Family Group Sheet", Provided to Elaine Beaudoin on March 10, 2017. [S2437] School Reunion Committee, Denbawn & Drumavaddy School Reunion 2007 Video, Two disc video, Denbawn: My School and My Home Place, by Andy Sullivan, page 56. [S2664] Multiple transcribers and multiple photographers, Ireland Genealogy Projects Archives, Cavan Index, Photos by Breedeen Nulty; transcription by Valerie Ackroyd. Image 151: "In loving memory of | Our dear mother | Katie Sullivan | Denbawn | Died 17th March 1960 | Age 58 years | Her husband James | Died 2nd February 1969 | Their son Andy | Died 13th December 2007 | And his wife Eileen | Died 19th Apri9l 2012. Denn Cemetery, accessed March 19, 2018. From: "Molloy, S. Marie Grace"
Thank you for your inquiry about your great aunt. She is referred to as Ann or Anna in some places. I will send you some information in the regular mail, but in addition, there are several more things that I can relay to you now. Sister grew up in Chicago and attended St. Andrew's Grade School, completed her high school here at St. Mary-of-the-Woods High School. She earned B.S. in Education from St. Mary-of-the-Woods College and attended Loyola University in Chicago. Her teaching assignments were quite varied. She taught in Washington, D.C., Fort Wayne, Richmond, Lafayette, Terre Haute, Indianapolis in Indiana; while she taught in Illinois at Norwood Park, Joliet, Chicago, and Palos Heights. She also was in Tulsa, OK and Chelsea, MA. Several places she was Superior which also meant she was the Principal of the school. On another paper in her folder, it listed her father's occupation as grocer. She named her paternal grandparents as Joseph Sullivan and Anna McGivney from County Cork, Ireland; her maternal grandparents as Dennis McCarthy from County Cork and Ann McA----- from County Wexford. She did not have the full name of her grandmother. I do remember Sister. I did not teach with her but saw her when we all came home to the Woods in the summer. Biography: Anna was in the religious order of the Sisters of Providence per the letters after her name in her sister, Frances R. Sullivan's, death notice. [S1606] Sr. Marie Grace Molloy, "Sr. Marie Aloysius," e-mail to Jack Sullivan, May 30, 2012. Find A Grave Memorial# 22059730.